Share your experience for 15% off your next order! Infuse old, medieval time wooden torches with a modern glass and metal styling, and you have an H Potter patio torch. These classic yet rustic home and garden accents can hang from a pergola, be placed on a tabletop, staked into the ground, or carried through the dungeon to find the captive princess! Choose from an H Potter Four Torch Chandelier for the ultimate in elegance, or the H Potter Table Top Glass Torch with Copper Top as a statement piece. If you’re a person who loves to entertain guests and family year round, investing in H Potter patio torches is well worth it. From summer nights where you’re lost in the swaying wick and melancholy mood, to winter evenings when you’re huddled around the the fire pit roasting s’mores and sipping hot chocolate, with the lined patio torches conducting an orchestra of fiery flames — H Potter patio torches bring warmth and ambiance. Why H potter Patio torches? H Potter patio torches are composed of metal and glass, so they’re stout and can withstand the outdoor elements. Our home and garden patio torches are virtually maintenance-free — to clean them, simply use a all-purpose cleaner to wipe them clean. 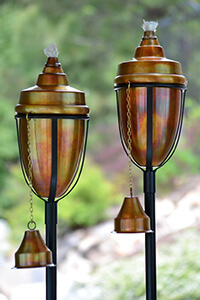 Our patio torches are also wonderful for creating the perfect setting. If you like the idea of soft lighting that brings out everyone’s best features and creates an Instagram-worthy backdrop, light up an H Potter patio torch. Avoid placing patio torches under low-hanging limbs and structures. Place the patio torches at least six feet from outdoor structures. If you’re staking a patio torch into the ground, it’s best practice to place them six to eight inches deep. When an H Potter patio torch is safe and secure, you can enjoy a worry-free evening that’s lit! Shop all of our H Potter patio torches to grace your outdoor home and garden spaces! Call us at 208-640-4206 OR SEND A TEXT MESSAGE TO THIS NUMBER FOR FASTER SERVICE.